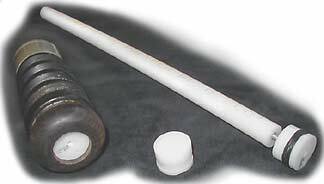 This page is intended to provide both a bit of history of and a guide to drone valves (also called "drone plugs" or "drone regulators" or even "piping plugs") for the Great Highland Bagpipe. The information provided is accurate to the best of my knowledge. If you have any suggestions or facts to add, feel free to contact me. There may be more makers out there, I'll gladly add them as information is provided. If you'd like to send me an image, please contact me in advance. Drone valves are placed at the base of the drone stock to help regulate air through the drones. 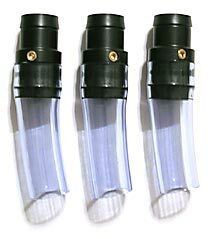 Or if the piper is utilitizing a hose moisture trap, the drone valves can be in-line. The intent is to stabilize changes in bag pressure with regard to the drone reeds, so the piper has steadier sound, easier starts and crisper stops. Volume is reduced slightly. Most of these are certainly most practical with a zipper or clamp-back bag—one does not want to have tie-in a bag repeatedly to position them—however, some allow insertion through the drone stock. On the other hand, Maurice Chisnall of Hastings, New Zealand says that Bill Menzies (Pipe Major of The City of Hastings Pipe Band) first invented drone valves and Bill still has them in his pipes. 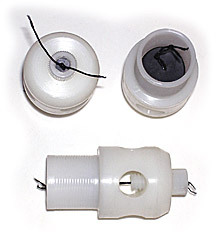 His are non-returnable petrol pump valves moulded between two pieces of plastic pipe. Picture provided courtesy Charley Kron, used with permission. Addition images of this particular set of pipes can be viewed on a dedicated page on the C.E. Kron website. 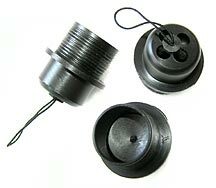 Hand machined of black engineering plastic, contains a rubber internal valve. 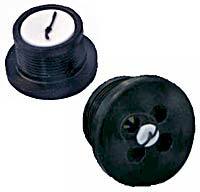 Shut off pressure is adjusted via the elastic tension loop and rubber tension stop. Spawning the modern commercial interest in drone valves, this concept was originally designed by a student of PM Robert Pearce, who was later given complete rights. Photo courtesy PM Robert Pearce. *Valve Donor: Eric Mrozek of Gardena, CA. Picture provided courtesy Janet Fraser. These are modeled after the McCallum valves, but have some design differences and retail at a much lower price than the McCallums. These will work with the Ross systems, as their size allows them to fit inside the tubes. Picture provided courtesy Jim Hudgins, Aberdeen Bagpipe Supply. Variation of other designs. Plastic, three vent holes, adjustable tension using an elastic cord. 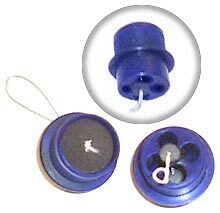 This is the first drone valve that can be inserted down into the drone stock from outside the bag. (And removed in the same manner.) Practical for those without an easy internal access bag. Manufacturer: Scott Nicholson of Smart-Drone Bagpipe Industries. Availability: Yes, only through retailers. Available through Lyons Bagpipes & Highland Supplies for Australia and New Zealand residents. These sell for approximately US$50.00 per set. These valves fit in-line on most hose moisture control systems. Strength of the valve is adjustable via an hex screw located on the side of the valve collar (clockwise tightens). These sell for approximately £15 (US$26) per set. 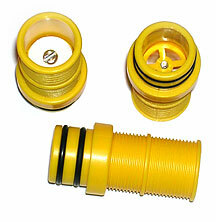 Yellow plastic body, ribbed side for hemping to install into dron stock, black rubber O-rings for securing to optional hose system. Screw adjustment for shut off pressure. Same as earlier versions in construction, but the number of openings changed to three holes versus four to improve performance. *Valve Donor: PM Robert Pearce. 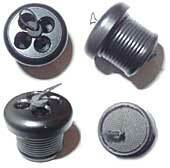 Like the Campbell Regulators, these fit into stock from the exterior of the bag via a tool. Valves contain a ball bearing valve. Unique vinyl tubing "tail" extends into the bag with the claim of preventing drone harmonics from entering the bag. Valve at end of "tail" can be altered to control the amount of airflow to drones. Not intended for synthetic bags when hoses to drones are installed. These retail for approximately US$28 per set. 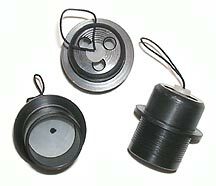 Similar to other valve designs, but integrates an finger-manipulatable tension adjustment screw as well as large air passage openings. Please contact me if you have any comments or suggestions regarding this page. This page last updated on Saturday, September 25, 2010. Page first added to the site on May 18, 2001 as part of the Drone Reed Identification page.